Families, singles and couples alike will delight in fun-filled stays at this charming retreat. 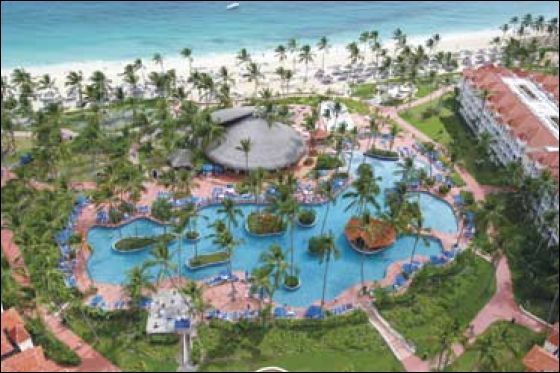 Adults to the resort will love the appealing selection of gourmet cuisine, expansive views of white-sand beaches, unique activities, sparkling swimming pools and a newly renovated theatre. While younger guests can take advantage of the entertaining kid’s club, children’s pool and mini disco. Whether you are wandering through the resort’s lush tropical gardens, diving into unique waterscapes or enjoying colorful Caribbean nights, this resort has something for everyone. 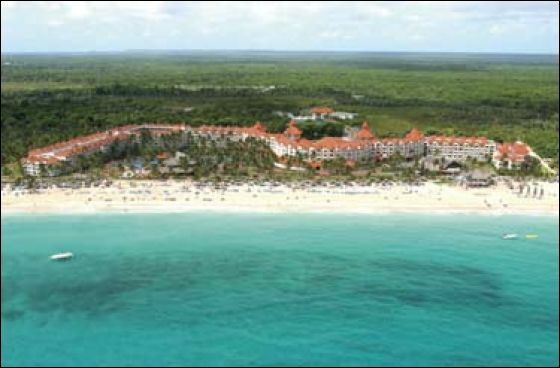 An amazing Resort on a dazzling beach, with 798 rooms in a winding S formation of white buildings, with red Spanish-styled roof tops. The lobby in warm tangerine color has comfy seating under a chandieler, which amusingly also happens to house a birds nest! The main restaurant, casino, disco and forum style-theater are on the same level. A staircase leads down to the main grounds and an arcade of stores and a bank. Horizontally inline with the beach, the property curves around gardens and a large main swimming pool with swim-up bar and 3 Jacuzzis on a raised platform. There are 6 specialty restaurants ranging from French to Japanese, for a sampling of fine cuisine and one main buffet restaurant with multi-choices of international style cooking. 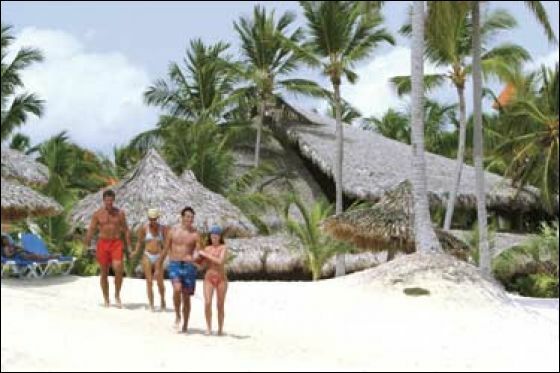 is on a 400,000 m² property, near the beautiful white sands. 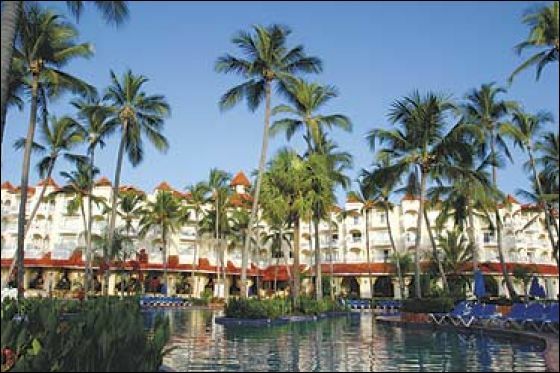 Barcelo Punta Cana is the most fun-filled Resort for kids. They'll have a blast on the circus trapeze, yes flying through the air on a harness. Or climbing a rockwall, with an ocean view at the top! Tip: For the best photograph, stand on the terrace of the dive shop to snap a breathtaking view of miles and miles of white beach set between to peninsulas of coconut groves. Tokio - Japanese restaurant (open for dinner only 6:00 p.m. to 10:00 p.m. Dress Code:Casual elegent required (no shorts, sandals, t-shirts, tank tops or jeans). 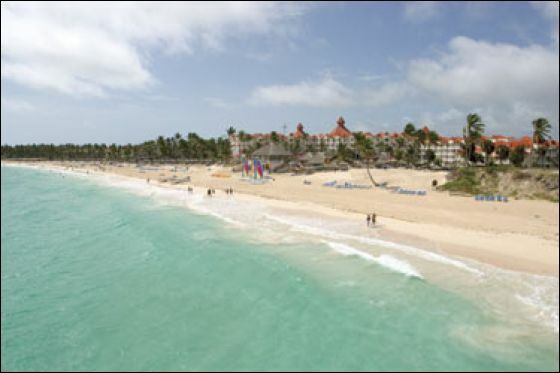 Conuco - Air-conditioned Dominican a la carte restaurant, open for dinner 6:00 pm to 10:00 pm. Dress Code: Casual Elegant- no shorts, sandals, t-shirts, tank tops or jeans. Roma - Casually elegant, air-conditioned Italian (a la carte) restaurant (open fordinner only 6:00 pm to 10:00 pm). Dress Code:Casual elegent dress required, men must wear long pants. Closed once a week. Beach Grill "El Marlin" - Poolside restaurant offering brunch buffet with champagne from 8:00 am to 12:00 noon and lunch buffet from 12:00 noon until 5:00 pm. 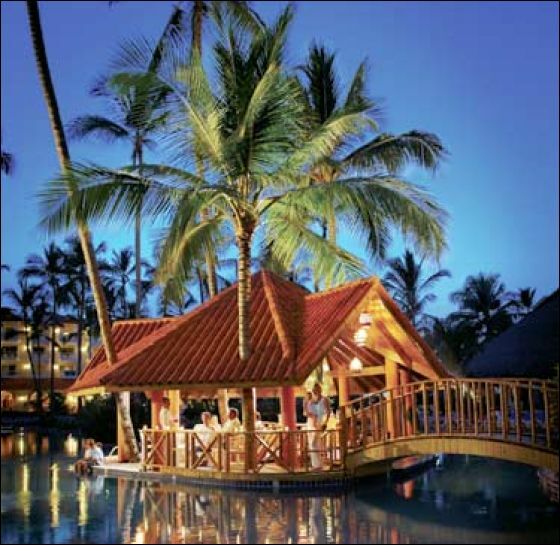 Seafood and a la carte restaurant for dinner (6:00 pm to 10:00 pm), reservations and casual dress required. El mirador Tex-Mex - A la carte restaurant. Open for light lunch from 12:00 noon to 3:00pm, Tex-Mex menu for dinner from 7:00pm to 11:00pm (some dishes with supplement). Dress Code: Men must wear long pants. Paris - Casually elegant, air-conditioned French (a la carte) restaurant (open for dinner only 6:00 p.m. to 10:30 p.m).Dess Code: Casual elegant dress required (no shorts, sandals, t-shirts, tank tops, or jeans). Non-smoking restaurant. Alcazar - Casual buffet dining; open for breakfast (7am to 10:30am), lunch (12:30pm to 2:30pm) and dinner (6:30pm to 9:30pm). Dress code applies: no shorts, nosleeveless shirts and no swimwear. The flight was great, arrived 20 min early. The pool was the best we have had yet in the Dominican and the beach was amazing. 85 degrees and sunny the whole weekend. The girls did the trapeze and boogie boards. Our rooms were beautiful, we could lay on our bed and look at the ocean. The food was ok but wasn't a big problem. We only made the entertainment one night. The drinks were not as good as the other places either. We had mamajuana for the first time.... that was a crazy day. For nine people traveling together everything went very smooth. The girls took over 400 pictures we will be sure to send you some.